As scripture tells us, we were each given a unique set of gifts from God. We are called to use these talents to serve others. Ascension has many opportunities to get involved. If you feel called to serve in an area that is not currently offered, please contact the rectory at 636-532-3304 with your idea! We would love to hear from you. Also, take note that any volunteer position working with youth requires completion of a Protecting God's Children workshop. See more information here. If you're interested in leading a bible study or small group, contact Chris Foeldi at [email protected]. Servers assist the celebrant of Sunday and school Masses. They also assist at funeral and wedding Masses. Servers may be boys or girls, grade 5 or older. Contact Father Michael Lampe at 636-532-3304 if interested in becoming a server. Servers are responsible for finding their own replacements if they are unable to serve at their assigned Mass. Please see the server assignments and make updates to them by clicking here. Volunteers clean the church and launder alter linens on a rotating schedule. Contact the rectory at 636-532-3304. This is a support group designed to reach out in sympathy to fellow parishioners at the time of death of a family member. Parishioners may contact the rectory at 636-532-3304 to volunteer. A blood drive is held twice a year. Volunteers are needed to give blood and to assist donors on Drive Days. Contact the rectory at 636-532-3304. Volunteers serve to facilitate congregational singing at liturgical celebrations. Contact Ralph Winn to volunteer [email protected]. This is a Reach Out Program where casserole bakers prepare a casserole each month for soup kitchens. Recipes are provided. Contact the rectory at 636-532-3304. Want to help our young kids get excited about Sunday Mass? The Ascension Children’s Liturgy is during 9:15am Mass most Sundays. They'd love more volunteers to help and to lead. It’s a fun, easy way to give back to our community and help shape our children’s faith and morals. Feel free to shadow and join the group any Sunday to see what it's all about. Notes for the liturgy lead to discuss with the children each week are provided at: http://catholicchildrensliturgy.blogspot.com/ Text Stacey at 314.402.5082 with any questions. To volunteer, click here. Open to adults and high school age youth, the choir sings at 9:15am Mass on Sundays and special occasions. Contact Ralph Winn at [email protected]. The Education Commission's purpose is to foster our efforts to educate all the children of the parish and strengthening all programs. This includes the Little School, Elementary School, and Parish School of Religion (PSR). For more information, email Jan Phillips ([email protected]) or Pat Gross ([email protected]). To sign up for this commission, click here. 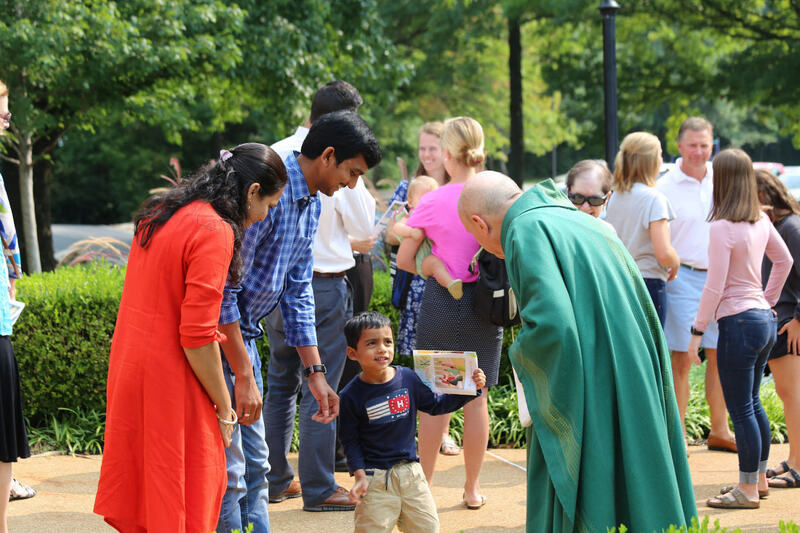 The Engagement Commission's purpose is to welcome and engage parishioners and visitors into our community to foster a stronger identity of membership among our parish family. They meet every few weeks at the parish. Contact Ken Bertha ([email protected]) or Rick Rice ([email protected]) for more information. To join this commission, please click here. The St. Vincent de Paul Conference operates a Food Pantry at St. Nicholas Parish in St Louis City on Mondays. They provide dry, refrigerated, frozen and perishable products to an average of 103 individuals each Monday. Donated food pick-ups from West Co. retailers begin on Sunday AM and continue through Monday AM. Product purchases occurs at the St Louis Area Food Bank twice per Month. All items are transported to the pantry for immediate use. Currently they have a 28 person team. If interested and able to lift, pack, stock, sort and transport product in your vehicle, contact Ken Bertha at [email protected]. The Gratitude Commission's goal is to increase our parish's understanding of stewardship. Stewardship is the grateful response of a Christian disciple who recognizes and receives God's gift and shares these gifts (time, talent, treasure) in love of God and neighbor. Contact Larry Cramberg ([email protected]) or Vicki Wilding ([email protected]) for more information. To sign up, click here. This is a fraternal organization of Catholic men, 18 and older, dedicated to charitable work in the broader community. Monthly meetings are held on the fourth Tuesday. Contact KofC here. These ladies are the wives, daughters, and mothers of living or deceased Knights of Columbus. They work for various charitable causes and support the charitable causes of the Knights of Columbus. Their meeting is separate, but at the same time as the Knights. Contact the rectory at 636-532-3304. These volunteers read the Word of the Lord at Mass. Contact the rectory at 636-532-3304. Please see the reader assignments and make updates to them by clicking here. This is a Reach Out program which provides an opportunity for parishioners to donate frozen leftovers to the Reach Out Centers. Collection is on the third Sunday of every month. Contact the rectory at 636-532-3304. The Liturgical Life Commission focuses around the liturgical events of the Church. It is the mystery of Christ that the Church proclaims and celebrates in her liturgy so the faithful may live from it and bear witness to it in the world (CCC #1068). Liturgy is the celebration of divine worship, proclamation of the Gospel, and active charity. For more information contact Katie Sullivan ([email protected]) or Nanette Rice ([email protected]). To sign up for this commission, click here. This is an ongoing service to the parish. Volunteers will provide a meal for the bereaved family of a parishioner following a funeral. Contact Chris Foeldi at [email protected] for more information or to sign-up. Each week Eucharistic Ministers bring Holy Communion to the residents of area nursing homes, and lead the recitation of the rosary on those days when Mass is not celebrated. The PSR provides religious education and preparation for the Sacraments for children grades K-8 who attend public or private schools. Volunteers are needed to assist with classes. Contact Robin Seiler at [email protected]. Volunteers pray for special intentions requested by parishioners. Contact the rectory at 636-532-3304. The Reach Out Program is organized to collect food, clothing and money, on the third Sunday of the month, for the poor at St. Vincent's Parish and the MAT center. Contact the rectory at 636-532-3304 or click here for more info. This organization supports respect for life from conception under natural death. It seeks to diminish and eliminate abortion and euthanasia through prayer and education. Legal protection for the unborn and practical help to women distressed by pregnancy are also offered. The organization raises funds and collects goods for homes which care for unwed mothers and disadvantaged children. Contact Jane Winters at [email protected] for more information. This is a program for those wishing to know more about the Catholic faith. Volunteers are needed to assist the program director with weekly classes covering a range of topics. Contact Father Thomas Molini at 636-532-3304. The Social Justice Commission continues to broaden and raise awareness for outreach and care to those in need. For more information contact Sandi Cramberg at [email protected] To sign up for this commission, click here. The parish sponsors a branch of the worldwide lay organization to help the poor and needy of the area. For more information see the St. Louis Council website. Call the rectory to volunteer at 636-532-3304. Volunteers welcome worshippers at Mass, collect and present the offerings, promote comfort and good order in church. Contact Jeanne Layton at [email protected] or Rosemary Quigley at [email protected]. Several years ago we welcomed the Pilgrim Statue of Our Lady of Fatima into our parish. Since that time, the statue has traveled throughout the parish visiting families and individuals for a week at a time. Welcome Our Lady into your home by contacting the rectory at 636-532-3304. Ascension's Youth Ministry (AYM) program aims at leading teens closer to Jesus Christ through the Catholic Church. Volunteers assist the youth minister with events and Sunday meetings. For more information see AYM website. To volunteer, contact Evie Sue at [email protected].